Hundreds of studies have linked shortened telomeres to aging and many immune system and other health problems. 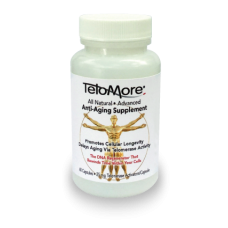 TeloMore is a naturally derived, concentrated Nutraceutical, extracted from the root of the Astragalus plant, which significantly diminishes this shortening process. Astragaloside IV has been reported in scientific journals to improve telomeres, diminish chromosome fraying, and enhance auto immune system functions and lifespan extension. Anecdotal reports also describe increased energy, more youthful endurance, increased brain and memory function, increased muscular strength and more. Astragaloside and/or its derivatives have been in use for over 25 years with no reported adverse occurrences. Telomeres are the end stretches of the DNA helix. As we age, our telomeres become progressively shorter. This is a natural part of the aging process. TeloMore simply helps slow down or reverse that process and improve cell longevity. TeloMore (Astragaloside IV) is extremely cost-effective. Most Astragaloside IV is extracted from tons and tons of astragalus membranaceus roots just to obtain gram quantities. We have found a better way, and therefore can pass on significant savings to our customers. 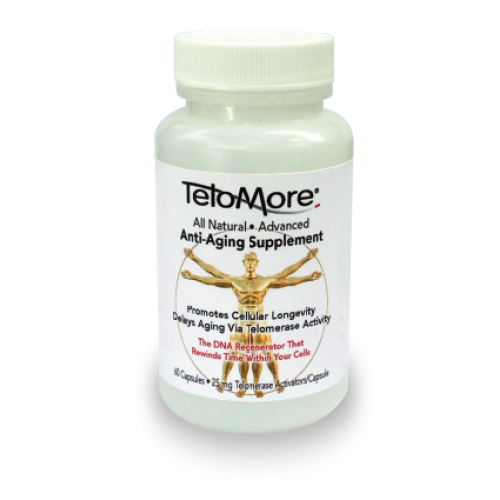 TeloMore is possibly the most potent, yet affordable, Astragaloside IV formula currently available in North America. This product is sold strictly as a nutraceutical botanical and/or dietary supplement and is not intended to diagnose, heal, treat, cure or prevent any disease or condition or infringe upon any valid patents or pending patents. No medical claims whatsoever are made for this product. Suggested Use: Take 1 or 2 capsules daily with water, preferably on an empty stomach, or as directed by your health care practitioner. After each year of use, take a 2 week pause before resuming consumption. Note: Resveratrol, Quercetin, Melatonin, Curcumin and Silymarin can possibly interfere with Astragaloside IV’s purported benefits, and they should not, therefore, be taken together with it. Consult your health care practitioner to make sure that any medicines or other supplements are not contraindicated, counterproductive or negatively affected by TeloMore Astragaloside IV. In order to test the effectiveness of TeloMore, your health care practitioner can take a blood sample before you begin consumption, then six months later, and have the telomere lengths compared. If desired the test can be repeated annually. A list of laboratories that run this test is available on request.